MONTREAL – The guessing game is over. 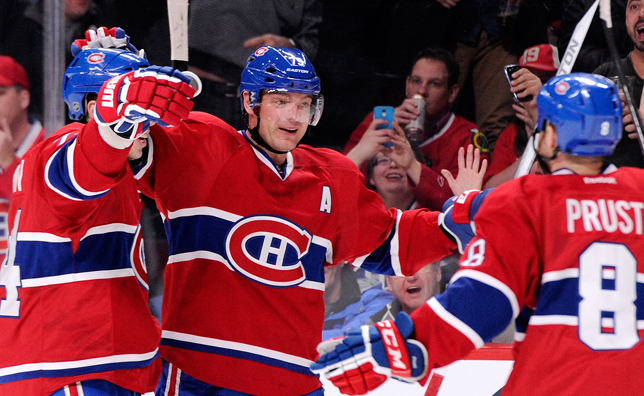 Andrei Markov will be happily donning the bleu-blanc-rouge for the next three years. During a conference call from Florida where he’s spending a hard-earned offseason, the All-Star defenseman commented on his freshly-inked, three-year pact. “I never doubted I’d be back with the Canadiens. I knew before last season ended that I wanted to stay in Montreal. I’m happy we came to an agreement and I’m excited about next season,” said the veteran blue-liner, who has played all 765 of his career NHL games with the Habs. When Markov hits the ice for the 2014-15 season-opener at the Air Canada Centre on October 8, it will mark his 14th season with the Canadiens, making him the longest-serving player on the current roster. “It’s special to spend that much time with the same team. That doesn’t happen often. I’m happy to be part of this organization. I want to thank the team for giving me a chance to stay here for this long,” mentioned Markov, who was the 162nd-overall pick at the 1998 Amateur Draft. The 35-year-old had a standout 2013-14 campaign, recording 43 points, including 21 on the power play – his biggest point haul since the 2008-09 season after seeing his 2010-11 and 2011-12 seasons both cut short with injuries. Having already earned his Canadian citizenship a few summers ago, the Russian rearguard is feeling more at ease than ever in Montreal, the only NHL hockey home he’s ever known. “I feel comfortable here. These are the best fans in the world. I want to stay with the Montreal Canadiens until the end of my career,” mentioned Markov, who will be 38 when his current contract comes to a close. While Voskresensk will always be where he’s from, Markov admits Montreal has a special place in his heart after spending the last decade-and-a-half in the city – and with the possibility of spending nearly half his life in Quebec by the time his three-year deal is up. “I could talk about Montreal for hours. Every time you jump on the ice is special. It’s an incredible feeling having so many fans behind you, supporting you,” shared Markov, who has been acting as an unofficial mentor to fellow countryman Alexei Emelin in the Habs’ dressing room. “I think we have a good team here. We have a lot of young players who can get better at different things. We have to look forward. Our last two seasons were good,” he added. With Markov patrolling the back end until 2017, the next three seasons should be as well.